newspapers — but take away the restriction, and he isn't even close. Ally Sloper beat The Yellow Kid into print by nearly three decades. Alexander "Ally" Sloper, F.O.M. (Friend of Man) made his debut in the August 14, 1867 issue of Judy magazine, the name of which was a play on Britain's long-running toon pioneer Punch. He was created by Charles H. Ross, author of many a penny dreadful (the British equivalent of America's "dime novels", precursors of the early 20th century pulp magazines). Ross lacked the artistic skills necessary to fully render his creation, so his wife, Emilie de Tessier (using the name Marie DuVal), inked it for him. Later, she took over the series completely. Detractors of the comics form will no-doubt be delighted (tho perhaps not surprised) to know that what may be the medium's first periodical character was created by a man who could barely draw. In Victorian slang, an "alley sloper" was someone who snuck out the back door and went "sloping" down the alley when the landlord came for the rent. And that was just the beginning of Sloper's disreputable qualities. He was also drunken, lecherous, inattentive to his family, scheming, and not very bright — just the sort of guy who gives a bad name to wherever he hangs out, and indeed, he was often cited by early critics who considered comics fit reading matter only for bums and semi-literates. His bald head was usually covered with a ridiculous top hat, and his nose was huge and red. He had a Jewish friend, Ikey Mo (short for Isaac Moses), who was probably the first ongoing ethnic stereotype in comics. Sloper continued as a regular character in Judy for years, and became quite well known to the British public. 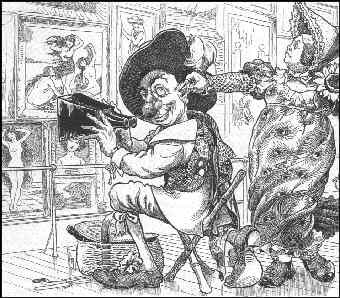 He appeared in a December annual, Ally Sloper's Comic Kalendar, from 1875-87; a summer annual, Ally Sloper's Summer Number, from 1880-87; a second December annual, Ally Sloper's Christmas Holidays, from 1884-1913; and nearly a dozen reprint books, starting with Ally Sloper: A Moral Lesson, in 1873. In the 1880s, Ross and DuVal left the character, selling him for a flat fee to Judy's publisher, Gilbert Dalziel. Dalziel launched a new weekly, Ally Sloper's Half Holiday, with a cover date of May 3, 1884. Thus, tho it didn't resemble today's comic books very closely, Sloper became the first comics character to get his own magazine. Cartoonist William G. Baxter handled Sloper in the new venue, succeeded upon his death (in 1888) by W. Fletcher Thomas. It was during the Baxter years that Sloper, in the wake of Palmer Cox's Brownies, began to be heavily merchandised. His image appeared on everything from pocket watches (decades before the Mickey Mouse wristwatches) to cast iron doorstops (a replica of which, long after his heyday, was used as an award for British cartoonists). In 1886, he became the subject of a popular song, "Ally Sloper's Christmas Holidays", perhaps the first published sheet music based on a cartoon character. He may also have been the first comics character adapted into film, which occurred in 1898. But the Thomas version lasted much longer, and ultimately became better known. By this time, Sloper wasn't quite the rogue he'd been at first. He was cleaner, more trustworthy, and was often seen in the company of Mrs. Sloper and their children, Alexander Jr. and Tootsie. Not exactly gentrified, but a lot of the comedy came from placing him in a gentrified setting. He was still reasonably slimy even during World War I, when Britain's A.S.C. (Army Service Corps) was nicknamed Ally Sloper's Cavalry, because of its alleged uselessness in battle. But it was probably World War I, and the societal changes it brought on, that did the character in. The weekly ended with its 1,679th issue (Sept. 9, 1916), tho it underwent a brief revival in 1922-23. Another revival was attempted in 1948-49 and a third in 1976-77. But Britain's class structure was far from what it had been before, and these new versions never caught on with the public — tho Sloper may have been part of the inspiration for his later countryman, Andy Capp, and quite likely influenced W.C. Fields (who is known to have been familiar with the character) in the creation of his stage and screen persona. Today's histories of comics contain few references to Sloper — the American ones, at any rate, where The Yellow Kid is usually lionized as the progenitor of comics. But in British histories, as well as those published in languages other than English, Ally Sloper has not been forgotten. Text ©2001-02 Donald D. Markstein. Art: Ally Sloper is in the public domain.